The bonding of oil-well cement to casing and well bore surfaces is critical to a successful well-completion. When using non-aqueous drilling fluids, such as oil-based and synthetic fluids, the ability of the spacer or pre-flush to water wet these surfaces becomes critical. 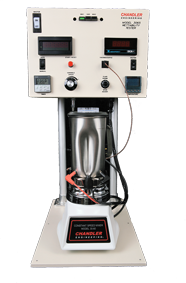 The Chandler Engineering Model 3065 Wettability Tester is essential for evaluating the wettability of spacers and pre-flushes that are intended to water wet the surfaces to which cement is expected to bond. The Model 3065 Wettability Tester provides all the functionality of the Model 3060 Constant Speed Mixer, PLUS the ability to evaluate the oil/water phase transition of oil based drilling fluids as they interact with spacer and/or pre-flush systems. The instrument measures wettability by continuously monitoring the electrical conductivity of the fluids subjected to heat and shear at atmospheric pressure. establish a reference conductance. The conditioned oil-external fluid is then placed in the pre-heated mixer cup and stirred. The water-based fluid referenced is then added until the digital conductivity meter indicates a stable water-wetting state. In addition to the digital display, the operator is able to visually ascertain the compatibility of the mud and spacer during this test. The control panel of the tester is safely and conveniently located above the mixing vessel. The control panel includes: the speed controls, the conductivity meter display, the temperature jacket controller, a display of the mixer’s current rpm speed and a timer with automatic shut-off capabilities to guard against over-mixing.